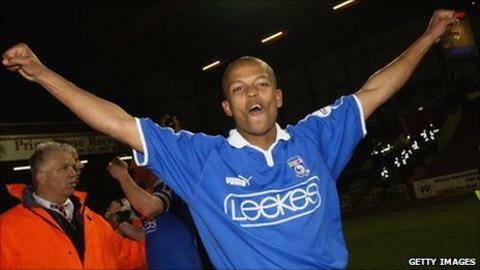 Striker Robert Earnshaw says he has returned to Cardiff City to help take them into the Premier League. The 30-year-old has signed on a free transfer from Nottingham Forest and finds Bluebirds' fans positive reaction to his move is "weird". "The thing I said to the manager [Malky Mackay], was I want success, really," Earnshaw told BBC Radio Nottingham. "I want to be at this club to try to try and get this club up and that's my intentions." Since leaving the Bluebirds in 2004 Earnshaw has remained a cult figure among Cardiff fans while playing for West Bromwich Albion, Norwich, Derby and Forest. In three seasons at Forest, the Zambia-born Wales international scored 45 goals and new manager Steve McClaren was hoping to persuade him to accept a new contract. But the temptation to return the club where he made his name proved too strong for Earnshaw. "I'm really looking forward to it because it's a place that I know and a place I've only got good memories of and good times of. "So I'm looking to go down there... looking forward to just working down there, being at home, seeing my family and my family coming to games and stuff like that. "It's a big factor, but I'm obviously sad to leave Nottingham Forest. "It's a tough decision because the fans just took to me as one of their own and I'm grateful because of that and that's why it's said to leave, but I'm leaving for a good place as well." Earnshaw was aware of Cardiff's interest several weeks ago and he took time to ensure it was the right move. He added: "It had to be right for me to go back home really to go back home and I think it was the right decision. "The decisions wasn't made until a few of days ago. "And really because the club [Cardiff] is where they are - they're challenging, they've been challenging. "I wanted to probably stay at Forest as well. "It wasn't a case of right, let's jump at it - I had to make sure it was right and make sure that he club had the right stuff for me to go for. "And for me with the new manager and everything I had to speak to them and see what their intentions were. "And they've pulled out everything, really to try and get me. From then there were quite a lot of options and after that really, [I] just sat down and decided what's the best thing for me to do and it was go back home, really." Earnshaw, who has cost £12,650,000 in transfer fees over the course of a 13-year career, has also scored 16 goals for Wales in 54 appearances. Cardiff have been failed challengers for promotion to the Premier League in the past three seasons. That cost Dave Jones his job at the end of the 2010-11 season, with former Watford boss Mackay appointed to take over. Mackay has also signed Andrew Taylor, Don Cowie and Craig Conway since joining the club.